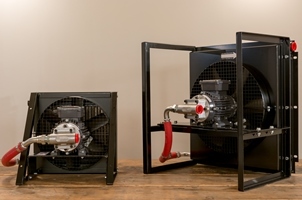 Specialising in air blast coolers (also known as air blown coolers), the Occo range has provided cooling solutions for companies across the world in a variety of fields, including general hydraulics, offshore, scientific and automotive applications. In fact anywhere there is a need for cooling - whether it be oil cooling, water cooling or air cooling - Occo has a solution. 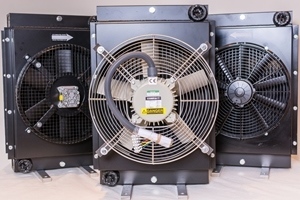 We have standard ranges of oil and water air blast coolers, but with 40 years experience behind us we can offer bespoke cooling solutions when required. Standard ranges can also be adapted to conform with non-standard requirements, such as marine environments or ATEX Zones 1 and 2. When a cooler can't go in the return line due to excessive pressure pulses, the solution is to take it 'offline' ie taking the oil directly from the tank and returning it back to the tank once it has been cooled. The Occo Offline range comes with a fully integrated motor pump unit to save space and installation time. 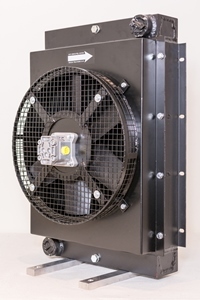 For more details of our range of pumped coolers visit the Offline product page. As no hydraulic system can convert mechanical to hydraulic energy with 100% efficiency, heat is always going to be produced in the system as a byproduct. This means there will be a rise in the oil temperature that must be controlled in order to optimise the performance of your system. As the temperature of the oil rises, its viscosity drops and the oil will lose its lubricating properties. This can affect seals and 'O' rings and can ultimately damage the whole system. At best the oil will have to be changed frequently at considerable cost. Installing an air blast (air blown) cooler ensures the temperature of the oil never exceeds its optimum working temperature. Air blast coolers can be installed almost anywhere, particularly in locations where water is not available or is too expensive to consider in today's climate. For more about the company behind the Occo range go to About Us.